First is the Acer Chromebase 2412 (pictured above), which will have an unspecified "8th Gen Intel Core Processor," up to 8GB of DDR4 memory, and up to 128GB of internal storage. The built-in screen is a 24-inch IPS 1920x1080 panel with an anti-glare coating. The whole unit is VESA-compatible, so you can use a different mount if you want. 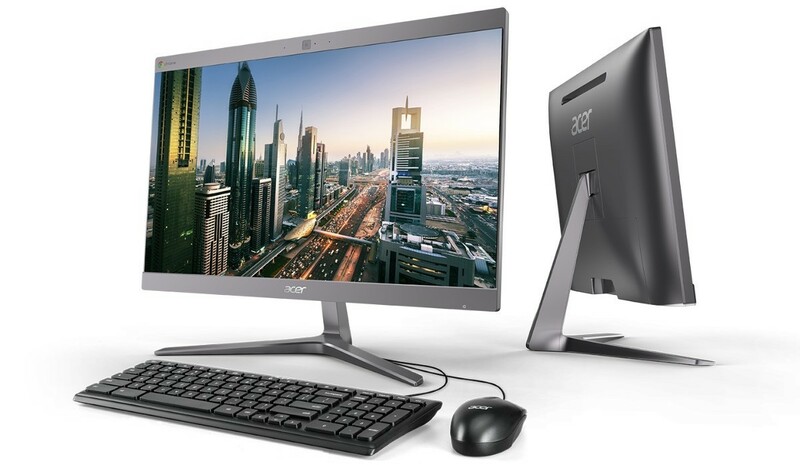 Acer also revealed the 'Chromebase for Meetings 24V2,' and as the name implies, it's intended to be a video conferencing tool first and foremost. A 5MP wide-angle webcam and dual microphones are built-in. Other specifications include an Intel Core i7-8550 processor, 4GB of DDR4 RAM, and 32GB of storage. I'm not sure why a dedicated video conferencing PC needs a Core i7 processor, especially one that runs Chrome OS — an operating system that is relatively light on CPU power. Both desktops have plenty of connectivity options, including USB 3.1 Type-C, USB 3.1 Type-A, HDMI, an SD card slot, and RJ45 Ethernet. They also have the Play Store, so you can install just about any Android app. Exact information about pricing and availability hasn't been revealed yet. AMSTERDAM, Feb. 4, 2019 /PRNewswire/ -- Acer debuted two sleek and elegantly designed Chromebases -- the Acer Chromebase for Meetings 24V2 for effortless video conferencing with Google Hangouts™ Meet, and the Acer Chromebase 24I2, an all-in-one Chrome device designed to fill multiple roles, either as an individual desktop working device, or as an in-store kiosk. The Acer Chromebase for Meetings 24V2 is a dedicated all-in-one touchscreen video conferencing system designed for individuals and small to medium-sized spaces, such as phone booths, huddle spaces and desktops. It helps businesses remotely collaborate and engage with colleagues and customers as though they were in the same room. Users can immediately make conference calls arranged and scheduled using Gmail™ and Google Calendar™, or simply by clicking a shareable link. It supports up to 25 callers out of the box through Google Hangouts Meet, up to 50 callers with Google's G Suite Business, and up to 100 callers with G Suite Enterprise. Users without a Google account can also join the call as a guest by simply clicking the meeting invitation link. The Acer Chromebase 24I2, powered by Chrome OS, provides a streamlined experience filling multiple roles in modern small and medium business. With an optional touch display, it's ideal as an individual desktop working device, or as a shared workstation. It can be deployed as a customer self-service tool placed in store fronts, in-store kiosks, hotel lobbies, supermarkets, and other businesses with customer facing scenarios. Businesses will appreciate the faster boot times, increased security, easier network and cloud management and applications that can be accessed and opened faster. The new Acer Chromebase 24I2 is also ideal for today's higher education classrooms, computer labs or school libraries as public sharing desktop PCs. It will fully support Google Play at launch, so students will have access to both Android apps and Chrome web apps for learning, research, fun and more. Apps load faster, graphics run faster and tasks can be run simultaneously without lag with an 8th Gen Intel Core processor, up to 8GB DDR4 RAM, and up to 128GB SSDs. This makes it ideal for heavy processing tasks like big spreadsheets and running multiple applications at the same time. The Acer Chromebase for Meetings 24V2 and Acer Chromebase 24I2 both feature a beautifully shaped chassis on a diamond cut stand, making it a welcome addition to the office. The Full HD 1920x1080 IPS narrow bezel touch display is anti-glare and capable of tilting between -5 and 25 degrees. Thanks to the optional VESA mounting kit, it can also be hung on walls, saving additional space in smaller rooms. The back cover conceals unsightly connecting cords, making the not only easy to use, but also easy on the eyes. Background updates ensure your device is up to date with the most recent feature enhancements and security patches, all without any end user downtime. Acer Chromebases work with Chrome OS's multiple layers of security to keep customers safer from the latest viruses and malware. Background updates over the air reduce manual maintenance hassles, and 24/7 support from Google provides peace of mind.